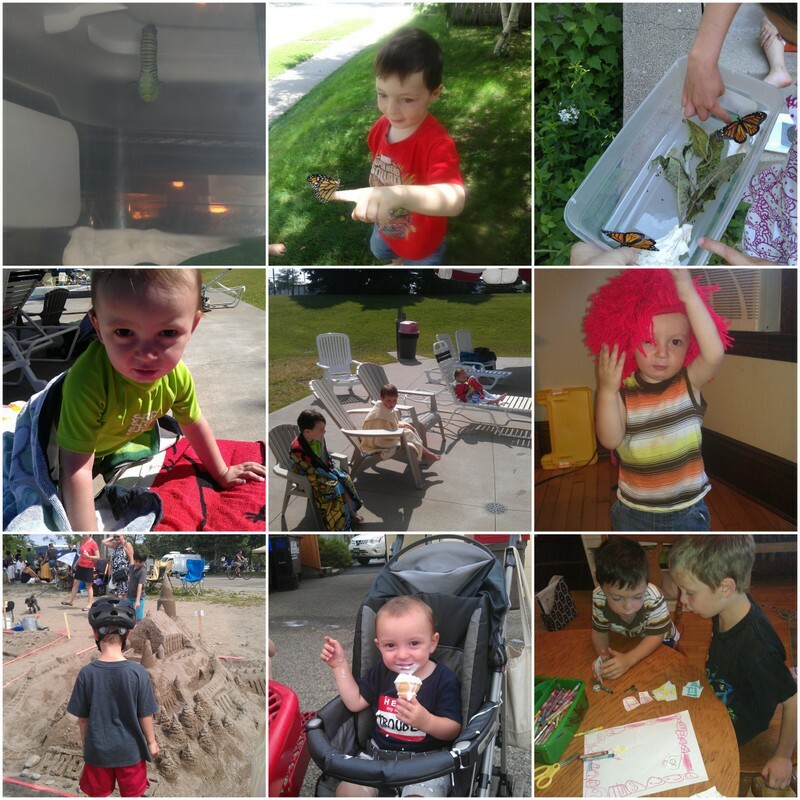 Time flies when you’re having fun…and we’ve certainly been having a ton of fun in the past three weeks since I have found time for a wrap-up post. Not pictured: Lots of playing with neighbor friends, Mr. E spending several days with Grandma, a couple lemonade stands, afternoons spent reading during Mr. J’s nap time, a neighborhood newspaper created by Miss M, watching Liberty’s Kids with our new full-series DVD set we received this week, and the end of the kids’ four week tennis class. What we’ve been doing hardly any of is any formal school work. By this time last summer, we had started back with a couple subjects. That just doesn’t seem like it is in the cards this summer. I’ve only just in the past week or two started really cleaning out the school room from our last school year, and working again on planning for the fall. 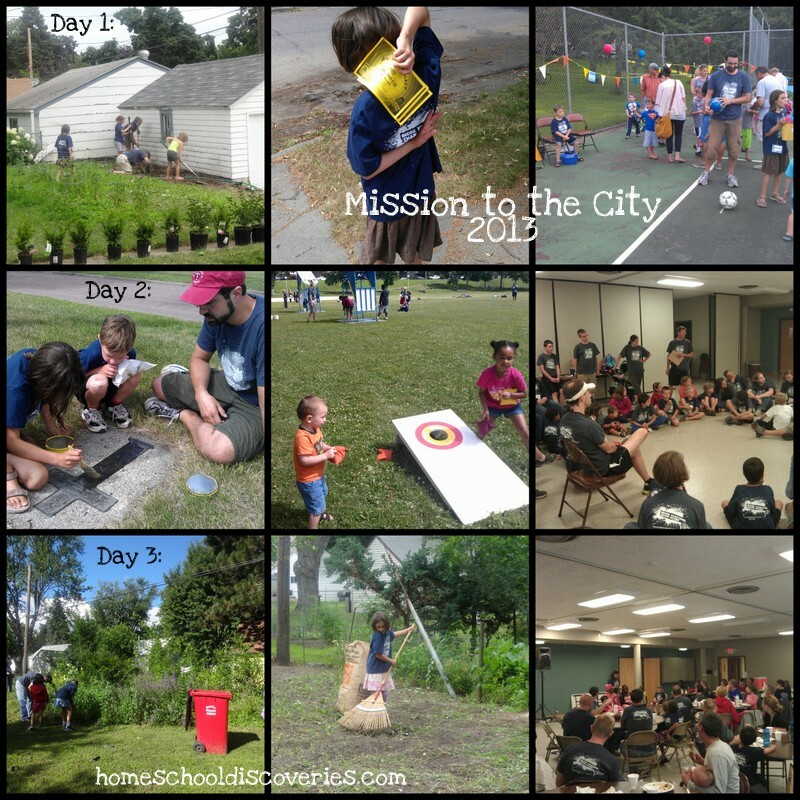 In the next six weeks we still have our “local mission trip” called “Mission to the City” for a half-week. we also have our church’s vacation Bible camp (which I am in charge of) and a two-week vacation. Then it’s nearly Labor Day, and it’s really time to start school. Here’s what I am thinking right now. I’ll be updating the “Our Curriculum” page as I get things more finalized. Logic of English Essentials with Advanced Lists (our second year through Essentials) for spelling and grammar, along with Scholastic E-books for additional grammar and editing practice. Write On! for writing, plus additional practice from scholastic E-books and other resources. Logic of English Foundations for spelling and phonics (reviewing parts of B and C, starting D when it is available). Possibly starting Essentials if we finish Foundations D or his reading and spelling ability move solidly beyond the point of level D.
Tagging along for US History and Earth/Space science as interested with Miss M (I’ll have library book selections especially for the boys). We’ll also pursue other interest-led science and history topics if desired. Mr. E needs some major handwriting practice. I’m not sure I want to use the instruction methods used in LoE foundations. We might use A Reason for Handwriting Level A or other copywork material. 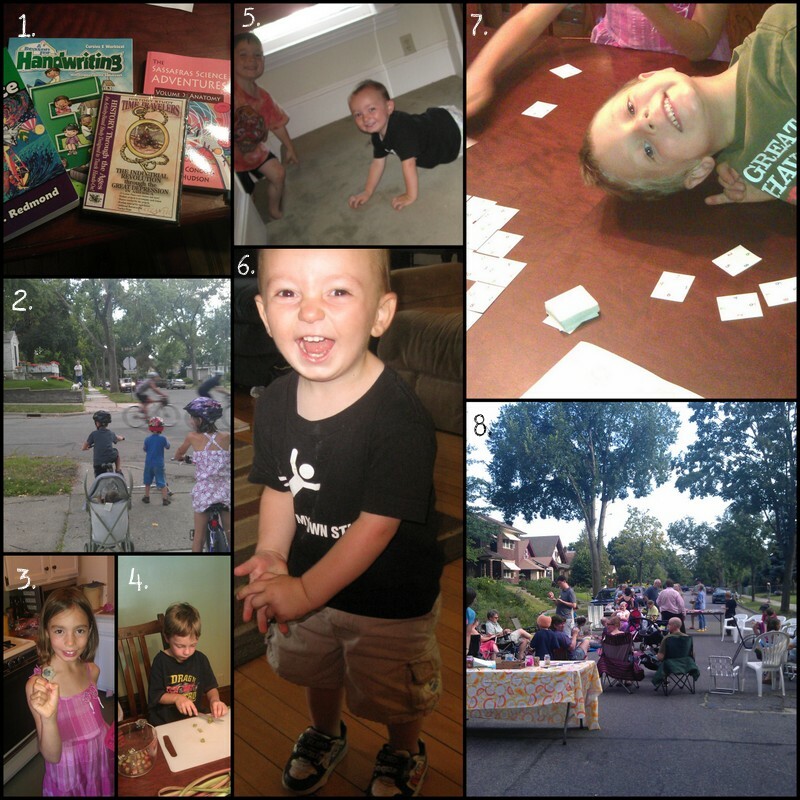 Logic of English Foundations A, at very gentle pace (plus possibly other letter-of-the-week sorts of activities from resources I already have or are freely available). 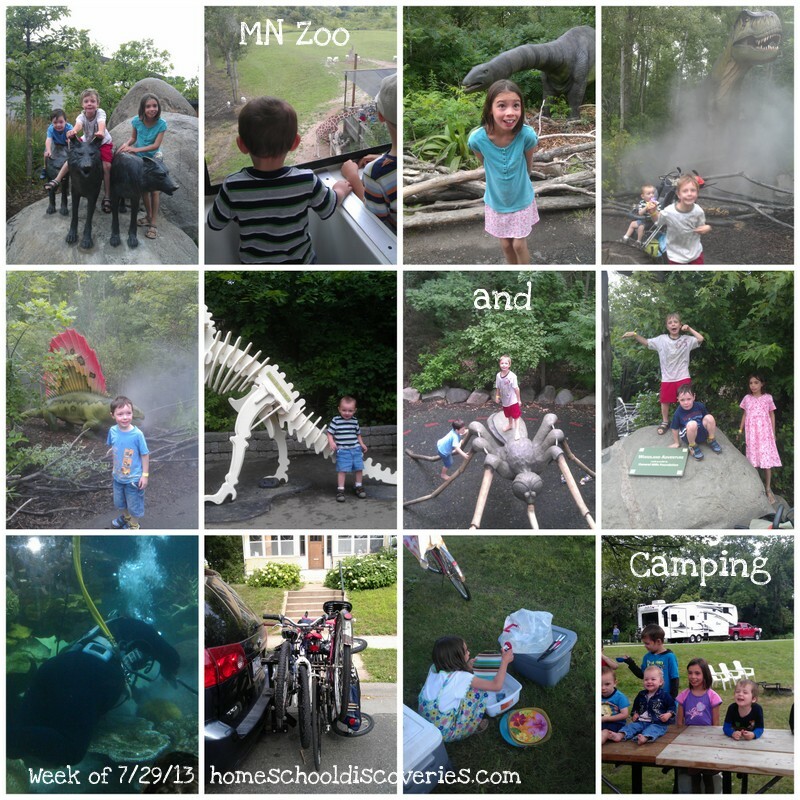 I’ll be fleshing that out and making more plans this summer for another great school year…but I am also super excited to enjoy our last few weeks of summer. 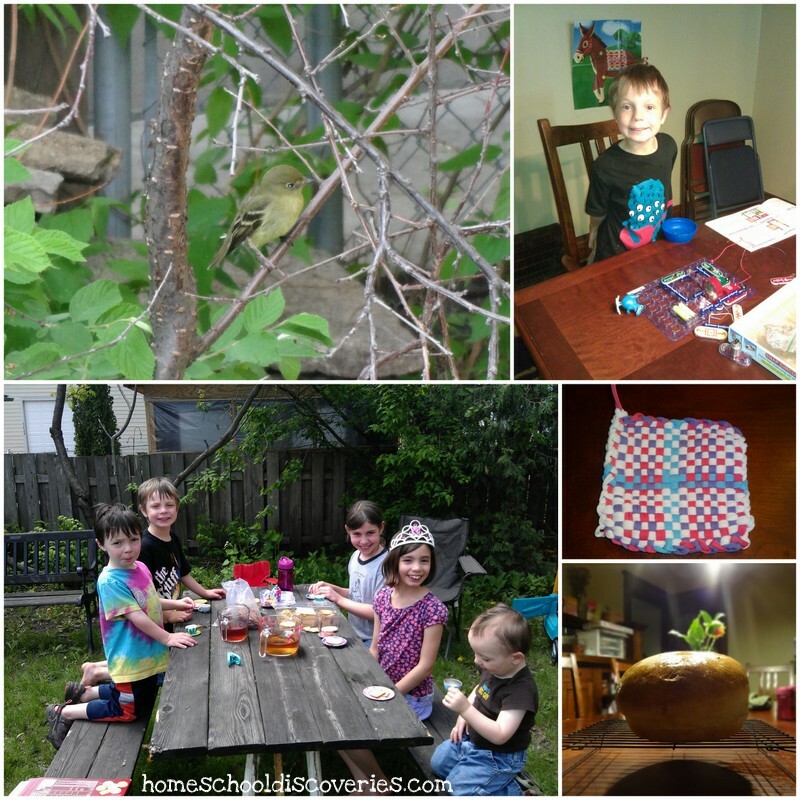 I’m linking up with Collage Friday and The Weekly Wrap-Up. I’ve had a little “side job” for over a decade helping edit a small devotional publication. My deadline is quarterly, which is a great situation because I can re-arrange my life for a couple weeks before the deadline to fit work in as necessary, and then I can ignore it for a couple months! Swimming lessons 8 days out of the past two weeks, plus random trips to the pool where we have a pass as well. 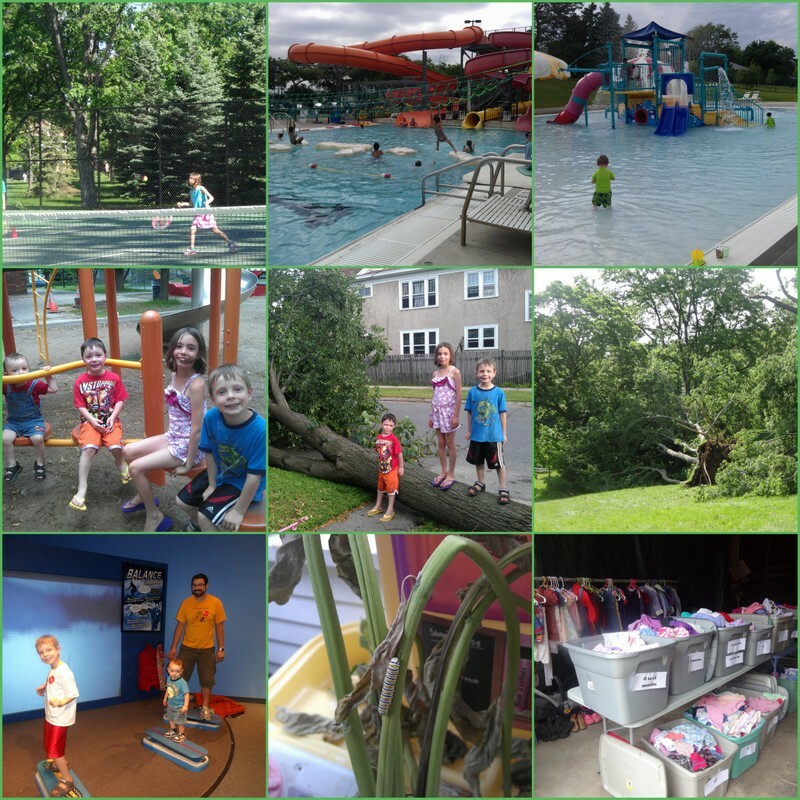 I like to get swimming lessons out of the way at an indoor pool before summer really starts…but the program we like was full for one of the levels the kids needed, so that bumped us into summer lessons at an outdoor pool. Miss M still has her guitar lesson…and the boys are thrilled to play at the park during lesson (and everyone plays all together for a bit afterwords). We had a HUGE storm that knocked out our power for only about 15 hours (some people were out for days). Thousands of trees fell all over the city (luckily, none of them were in our yard!). Oh, and on top of all this…I had a garage sale with my mom and a neighbor that lasted three days over two weekends. Crazy!!! It was supposed to be last month, but we had to postpone it due to rainy, cold weather. At least it was a successful sale and I am pleased with how much stuff I got rid of and how much money I made. 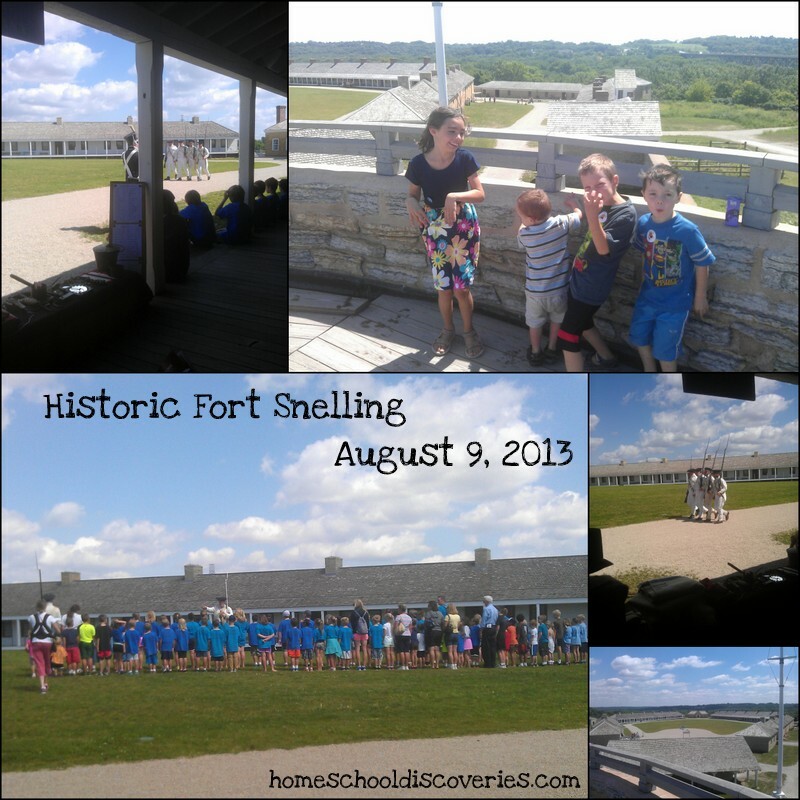 Needless to say, not a lot of organized “summer school” activities took place…though we have been doing a lot of reading aloud to relax from all this craziness. Here’s to a (maybe) relaxing weekend, and hopefully finishing my editing before the 4th of July holiday. Happy Friday! 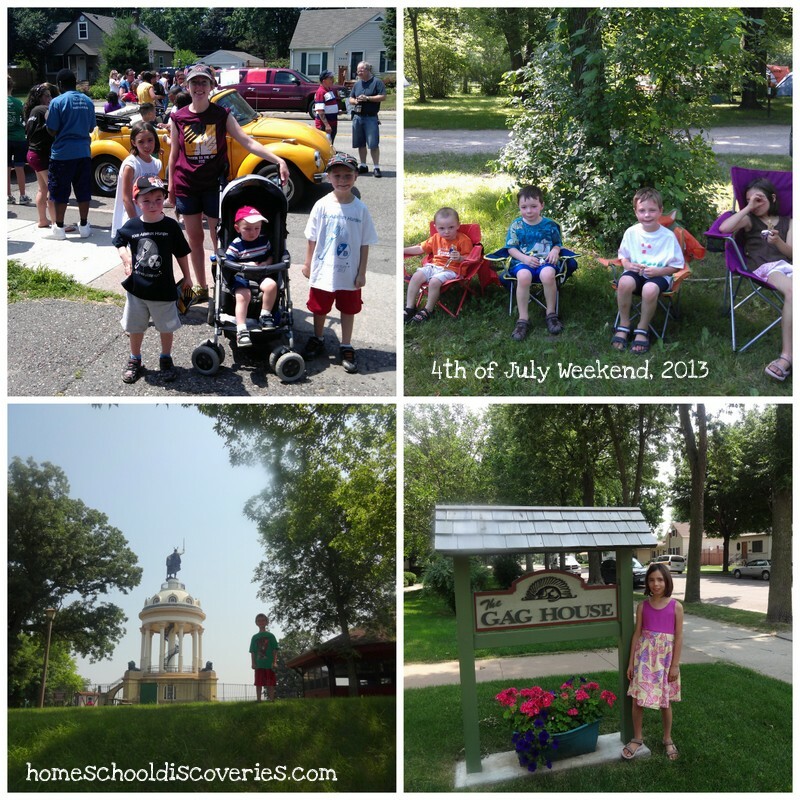 Last week at this time we were heading to the Chicago area for a four day “mini vacation.” We went for a family event on Saturday, and had Sunday free for sight seeing (driving there and back took most of the other two days!). 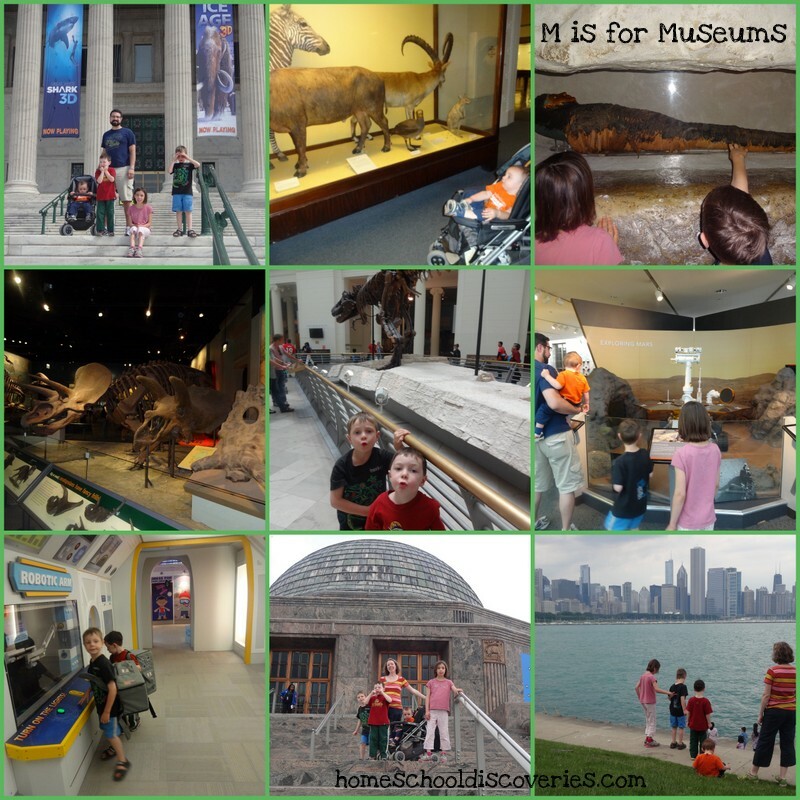 A Trip to the Field Museum and the Adler Planetarium in Chicago. The day after we returned, Miss M left again to spend the rest of the week with my mom. Grandma takes each of the three older kids for a special visit “one on one” each summer. It’s a fun chance to get extra time with her in a different way than they can with their siblings around. Miss M will return later today! 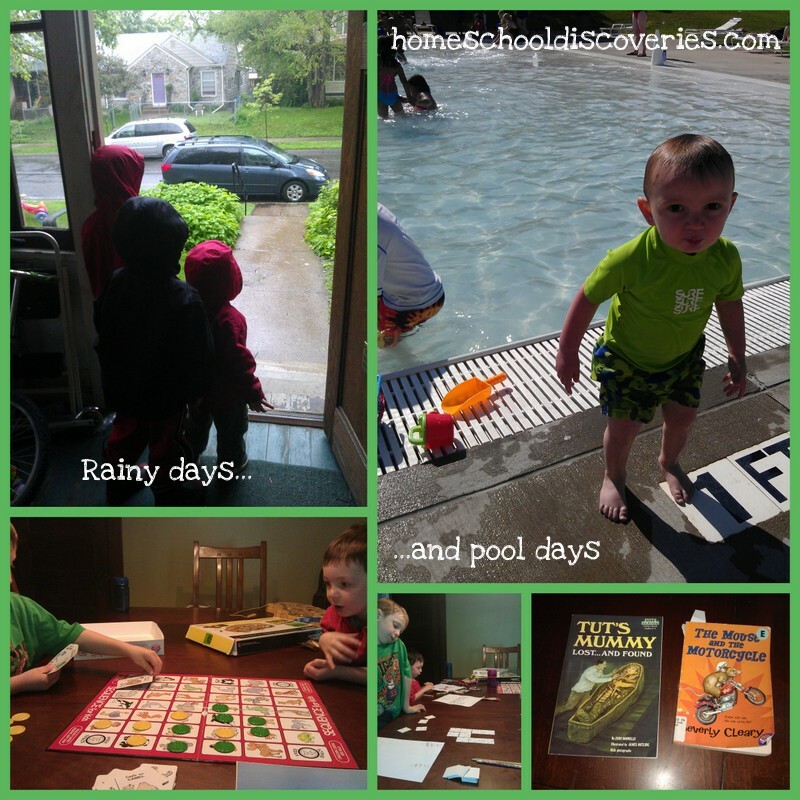 We had one completely rainy day — which was the perfect time to play board games and math games, enjoy some color by number printables, and do lots of reading. Ever since our visit to the Field Museum, the boys have been very interested in mummies. I pulled out a few books I was collecting for our next trip through ancient history, and we also watched a Netflix documentary about Egyptian mummies. I also started a new read-aloud with the boys — The Mouse and the Motorcycle by Beverly Cleary. Mostly Mr. E is listening to this one, and we’re read at least two chapters every day this week. Despite the fact that it’s not overly hot, we went to the pool twice this week. We’re making the most of our season pass…even if it means that I’m shivering while I follow Mr. J around the little kids’ pool. I totally flopped at having Mr. E practice reading this week. We’ll try and get back at that next week, I guess. I have a suspicion we may end up back at the pool later this afternoon if it’s not raining. Then we are looking forward to a busy weekend. 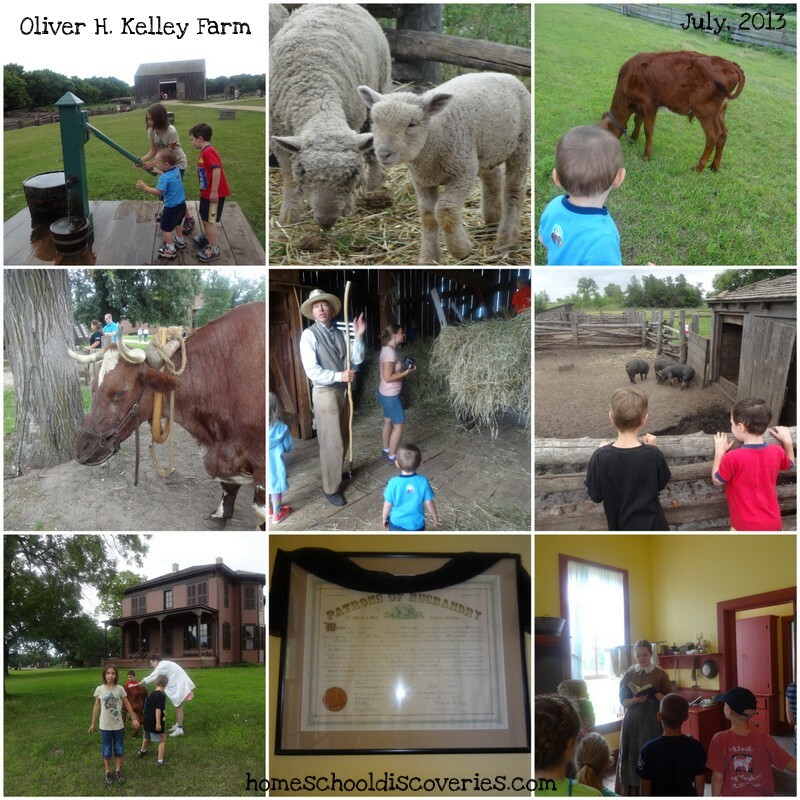 This was our third week of summer break — though the weather has still not been very cooperative to make it feel really like “summer.” We also started adding in just a light amount of “summer school” into our schedule. 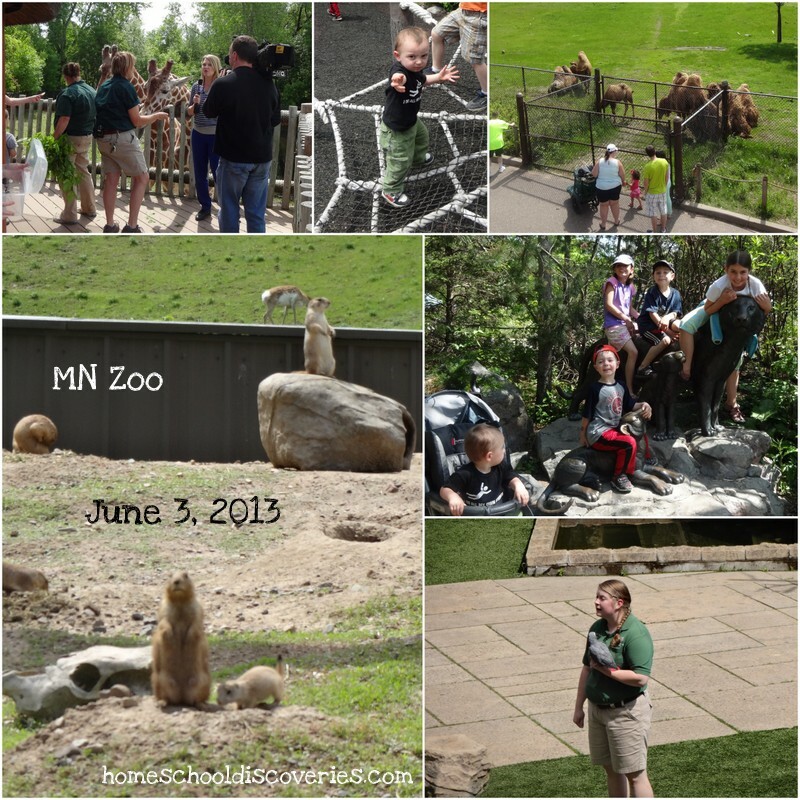 We especially enjoyed the special exhibit of African animals, the outdoor Bird Show, and the baby prairie dogs. Baby prairie dogs are really adorable! 4. Though we don’t own a cat of our own, Miss M really loves cats a lot. So much so that she spent some of her birthday money on jar of catnip to make homemade cat toys as gifts for friends with cats, and for herself to use while playing with the many friendly cats on the block. 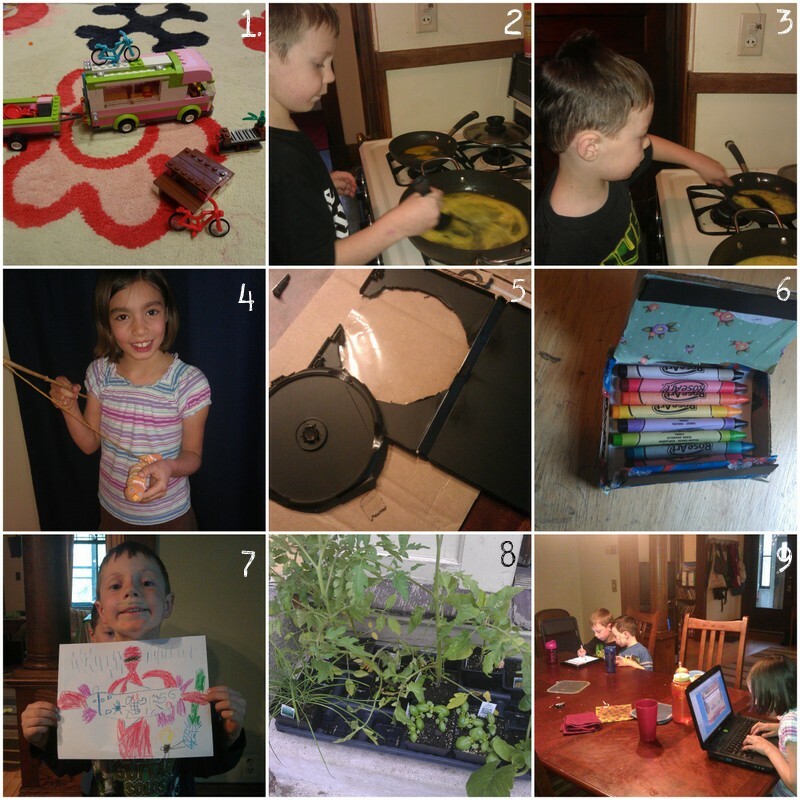 Thanks to Family Fun magazine for a great idea (I continue to get this magazine not because I ever take the time to read it…but because Miss M loves the crafts and other fun ideas!). 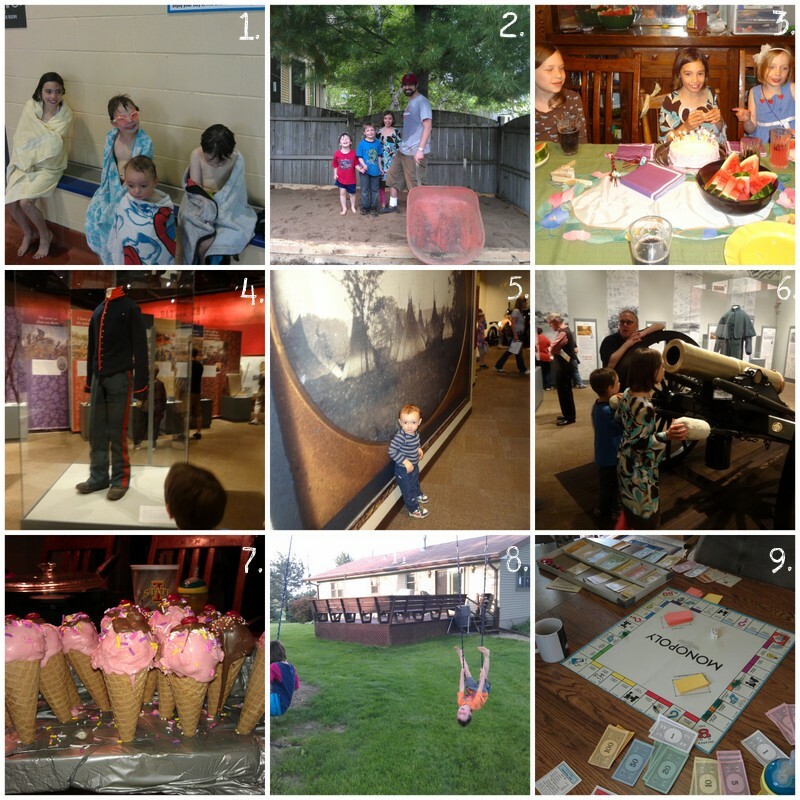 5.-6. Speaking of fun ideas, Miss M really wanted to make this travel art case she saw on one of my Pinterest boards. It was a total fail (my fault — I couldn’t figure out how to properly cut the case). She made a small cardboard-and-duct-tape small crayon box instead with inspiration from daddy. 7. With continued less-than-ideal weather much of the week, Mr. E created art work as well. I really liked this one he is holding up in the picture. I think he said it was a “Red Guard with a Double Bladed Lightsaber.” Or something like that! 8. We finally planted a garden. The kids and I took advantage of a short break between rain storms and planted a few veggies on Wednesday afternoon. We’ll see if the weather is favorable the rest of the summer for actually growing any vegetables!